Klip Gallery: Localytics – How can we help you today? Localytics is a Mobile Engagement Automation tool that brings marketing and analytics together across the user lifecycle. Compare your revenue to the number of users and sessions on your app. Show the funnel from events in your Localytics account. Visualize on a map where the majority of your users are coming from. Track your users and sessions over the past 30 days, and compare it to the previous 30 days. Use this simple, yet effective, bar chart to compare your new versus returning users over the past 7 days. Track the number of times your users triggered an event over the past 30 days. 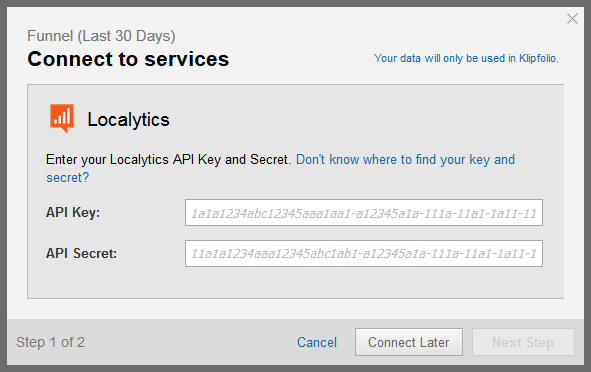 Log into your Localytics account and find your API Key and Secret. Select a Localytics Klip from the Gallery. You are now asked for your Localytics API Key and Secret. To find your API Key, in a new tab, Log into your Localytics account. In Localytics, on the bottom left corner, select Settings. On the top navigation menu, select API Keys. On the API Keys page, copy your API Key and API Secret, and paste them into Klipfolio. 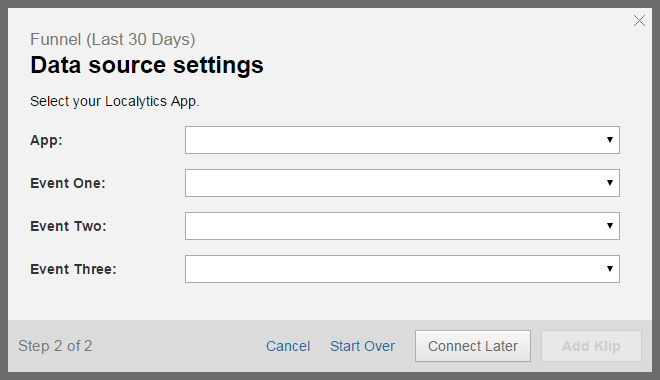 Under Data Source Settings, Select one of your Localytics apps from the drop-down menu. Depending on the Klip you are adding, provide additional information.